Luxury Real Estate Marketing Tip: Are You Suffering from Bloggers Block? As a luxury real estate marketing professional, consistently adding fresh, new, original content to your website by blogging is good for your ranking in Google. More importantly, it can help expand your sphere of influence. That is, if you are writing original content that is buzz-worthy, share-worthy, newsworthy and follow-worthy. But, how do the best bloggers avoid getting stale? How do they prevent Bloggers Block? The antidote to Bloggers Block can be summed up in this way:BE CURIOUS When you are passionate about your subject matter, you naturally become interested and open to new, fresh information that others do not even bother to perceive. You become a magnet for news! One of our favorite pastimes is strolling along the beach in Santa Barbara. We discovered early on that the beach is never the same from day to day. The tides continuously change. They bring new creatures and sea treasures to our attention every time. The people are new. Even their dogs are new. We have learned about so many breeds of dogs that we did not know existed. And, we are cat people! 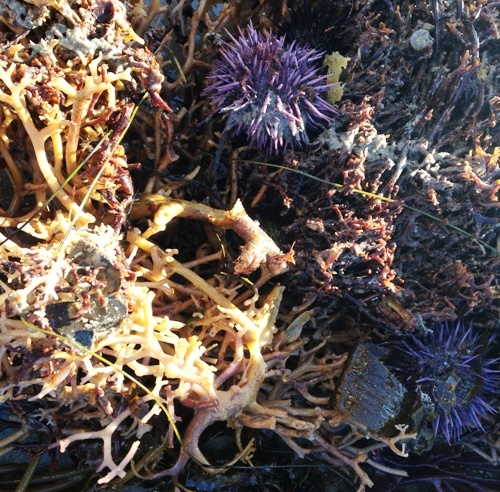 Recently, we passed by a couple of young girls who were squealing about some discovered treasure that was clinging to the base of a garland of kelp. It was a bunch of sea urchins. We had not seen one up close before that day. Yet, sea urchins are known as “Santa Barbara gold” because they grow in great abundance right off our coast where they are harvested, then exported to far off places like Japan. Had those girls not been so excited we probably would have passed that kelp plant right by. Instead, we were enriched by their discovery and our research on the subject. As a journalist, blogging can introduce you to new worlds and new people who can become potential referral sources for your luxury real estate marketing practice. So, if you are suffering from Bloggers Block, just be curious. That will get you right back into the flow of following your passion.